The other day I had to go to Knightsbridge and it was awful. The crowds of tourists milling in and out of Harrod’s, the rows upon rows of astronomically expensive designer shops and the worship of consumerism and materialism for its own sake sicken me. Did you know that Harrod’s has a bookshop? It’s filled with screaming children, smells overwhelmingly of perfume and has Celebrations, the book about nothing by Pippa Middleton, on display. After about five minutes in there, I decided to take the long way home and go via South Kensington for a little bit of sanity. After the madness I had to walk through to get to it, I don’t think I can put in words how much of a relief it was to come to this quiet little street and a bookshop that has real class. If the future of book-buying is a loud, chaotic, overly-perfumed room sandwiched between the Luxury Gifts section and a toy shop, I want no part in it. Give me South Kensington Books any day. I would gladly forsake the company of the rest of human kind and even pay a bit more to buy my books here, where the money spent is so much less important than the experience of book-hunting. But this little bookshop warrants so much more than a comparison with Harrod’s, so I’ll stop my griping now and give it the attention it doesn’t demand, but nonetheless deserves. 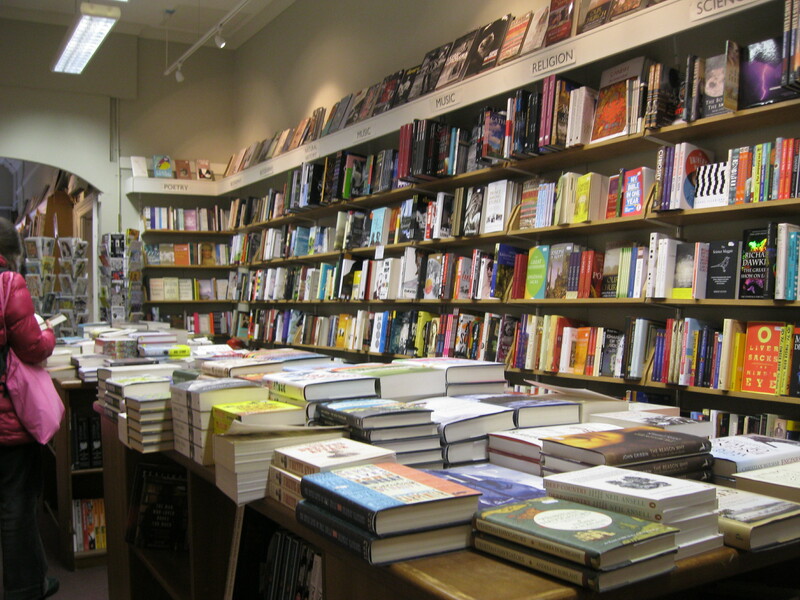 South Kensington Books blends perfectly into its surroundings; it’s elegant, understated, quiet and absolutely lovely. Its front window display is one of the most inviting I’ve ever seen with big beautiful cookbooks, children’s books, history books, novels, maps and postcards. Above the books you can just about glimpse a preview of what’s inside; dim lights, wooden shelves and rows and rows of new friends to meet. I blame this window for drawing me in one too many times and taking altogether too much money from me over the years. The first room is full of your usual bookshop fare. On one wall is its very well-stocked fiction section, where you’ll find most of the classics, contemporary fiction, the current bestsellers and all the award-winners. All the books are brand new and ever so slightly cheaper than retail price. For example, the retail price on Within a Budding Grove, which I bought and am now dying to read, was £9.99, but I got it for £7.99. So, no, not a competitor with Amazon on price, I’m afraid, but they certainly undercut Waterstone’s. There’s also a fantastic selection of beautiful art books, which I’m afraid I don’t have the intellect to appreciate nearly as much as they deserve, but still love to admire. The travel book section is wonderful (if a bit Lonely Planet-heavy, but what can you do?) and I nearly bought myself a guide book for my upcoming trip to Copenhagen, but decided I’d rather wander the streets without guidance or expectations this time around. Don’t worry, if there’s a bookshop, I will gladly offer up the Matilda Project’s first Danish entry. But back to South Kensington. In the back room is the bookshop’s really amazing selection of history books. This is my new go-to bookshop when looking for presents for my dad. The man is obsessed with history. For Christmas I got him Jerusalem: A Biography by Simon Sebag Montefiore. It’s probably 700 pages but he was so excited and I know the enormous tomes on display here would make him very happy. British and American history and politics are very well-represented, but the selection is not quite as Western-biased as a lot of bookshops I’ve been in; the rest of the world gets its say too. The back room also has a small selection of children’s books and a wall full of beautiful books of poetry. They had the selected poems of Keats, Byron, Blake and Wordsworth in the lovely hardcover collections with beautiful covers that Faber & Faber released recently, where a contemporary poet selects the poems and writes the introduction. Have you seen them yet? They’re gorgeous. I almost bought Memorial by Alice Oswald, which is a brilliant collection of poems that’s sort of a re-writing of the Iliad. She explains it much more eloquently than that though. I wanted it, but two books in one day seemed a bit decadent. 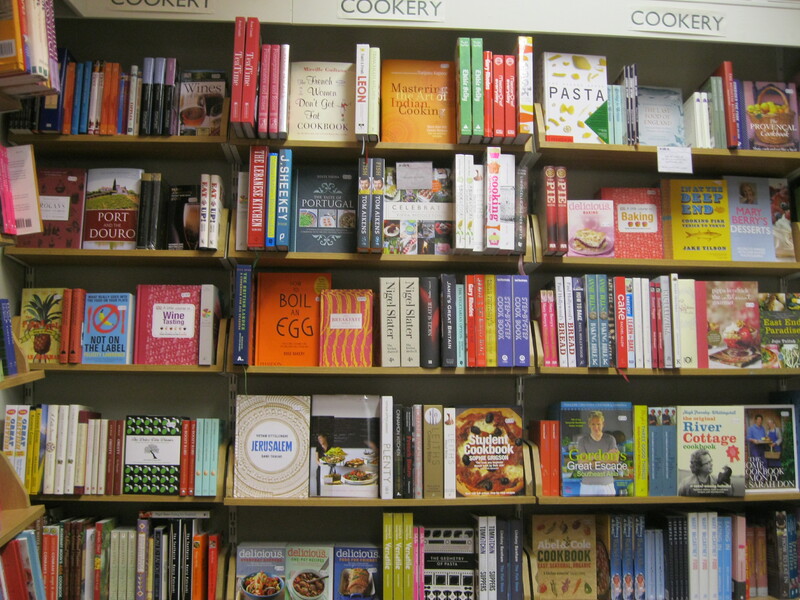 Oh, and the entire back wall was covered in cookbooks of all shapes and sizes, ranging from your conventional recipe book to a guide to what flavours work well together. The last time I was in here, they also had a whole shelf of Folio Society editions of some classic and some contemporary novels. If you’re not familiar with them, the Folio Society produce beautiful hardcover copies of books, working on the ethos that ‘Some books are worth treasuring.’ Their books are the kind that you use to build your perfect library, and then pass on to your children. I went in once and saw a really wonderful Folio Society edition of the Complete Works of Arthur Conan Doyle and from then on have been pretty much sold. Another time, I found their copy of Disgrace by J.M. Coetzee which had amazing colour illustrations by Andrew Gibson. On my most recent visit, though, they were conspicuously missing. I asked the bookseller what had happened to them and he’d told me that since the last time I’d been in there, maybe a month earlier, the majority of them had been sold. This is a good thing, I suppose, since it means the bookshop must be doing all right and that people still care about having books that are more than just a file and still feel the need to treasure them, share them and pass them on. I’m not going to pretend I didn’t miss admiring them though. ‘Rekindle your love of Beautiful Books’ is obviously a not-so-subtle jab at Amazon and their Kindle and I think it’s brilliant. Wake up, humans, your Kindles aren’t special! And here we go, time for another one of Emily’s rants. I get a lot of comments on this blog saying things like ‘I have and Kindle and I love it, but I still love paper books!’ I have a friend who owns one and says as useful as it is, she’ll never stop buying real books. Well I’ve got news for you, guys. Sorry if it offends, but you can’t have both. If you want to own a Kindle, knowing that it threatens to put bookshops and publishers out of business and stifle high-quality creative output by letting it get lost in a sea of self-publishing and digital ‘files’, you are not allowed to complain. You’re not allowed to moan when your favourite newspaper stops producing print copies. You’re not allowed to grieve when your local independent goes out of business. Because you know what? It will be your fault. If you stop going to libraries and bookshops and buying from small publishers and supporting authors at events in real life, you’re not allowed to complain when those things disappear. 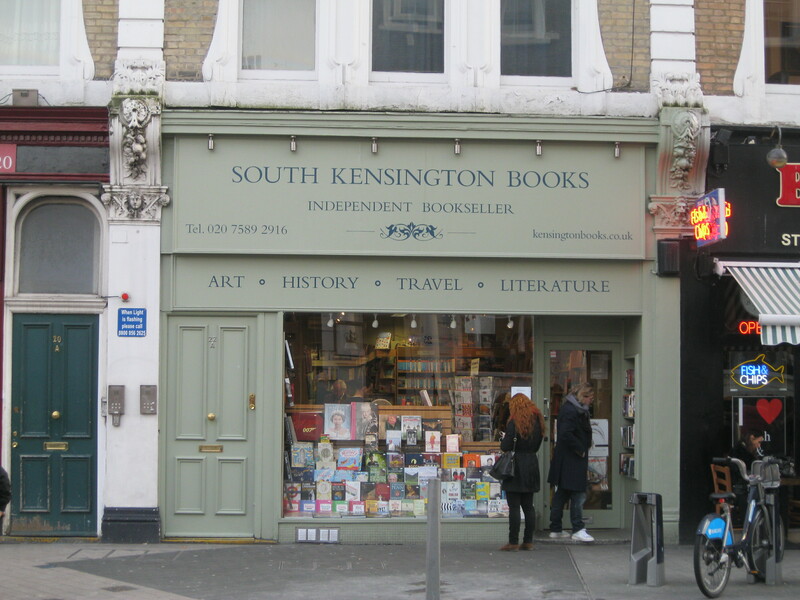 If you buy more ebooks than print books, whether you like it or not, you’ll play a part in putting amazing places like South Kensington Books out of business. When HMV went into administration, I listened to my friends complain about how there would be nowhere on the high street to browse, to fondle physical copies of the music and film they love, to talk to humans about them. Finally, I got fed up and asked them how many of them had actually gone to HMV in the last year and was met with silence. If you say you love something but don’t support it, what kind of love is that? It’s like not voting and then complaining when the candidate you wanted doesn’t win. So listen to the Folio Society and take the lead from this gorgeous bookshop. If you love books, please, I beg of you, support the independents who really care. Support the man behind the till at the South Kensington bookshop who spent twenty minutes trying to locate the book a woman wanted, working from the single clue ‘They were talking about it on Radio 4 yesterday.’ Support my wonderful friend and former bookshop co-worker Wendy, whom I once watched patiently talk to a family for 30 minutes trying to find a perfect book for each of their three children. And support the values that made my dad come home from work every night just to turn the pages with his five-year-old, trace the words and letters with his finger and tuck her into bed before going back to work, just because he knew that those moments would be what mattered. This entry was posted in London and tagged Amazon, bargain books, book-hunting, books, bookshop, bookshops, bookstore, bookstores, cheap books, children's books, Harrod's, I Hate Amazon, I hate Kindle, independent bookshop, independent bookshops, independent bookstores, kindle, literature, London, London bookshops, london sw7, poetry, reading, South Kensington, South Kensington Books, The Folio Society, Thurloe Street, travel books, V&A, West London. Bookmark the permalink. Absolutely 100% completely agree. The world would be a sadder place without bookshops. I just wish I could afford to support them even more (and had time to read all the books I want to buy). I wish I could hug this post. I love it. Yes, yes, yes! Totally agree! Thankyou for this. When I am old and retired I will visit all the bookshops you recommend. Thank you for reinforcing my view that I must *not* get a Kindle!! How much do I agree with this post? 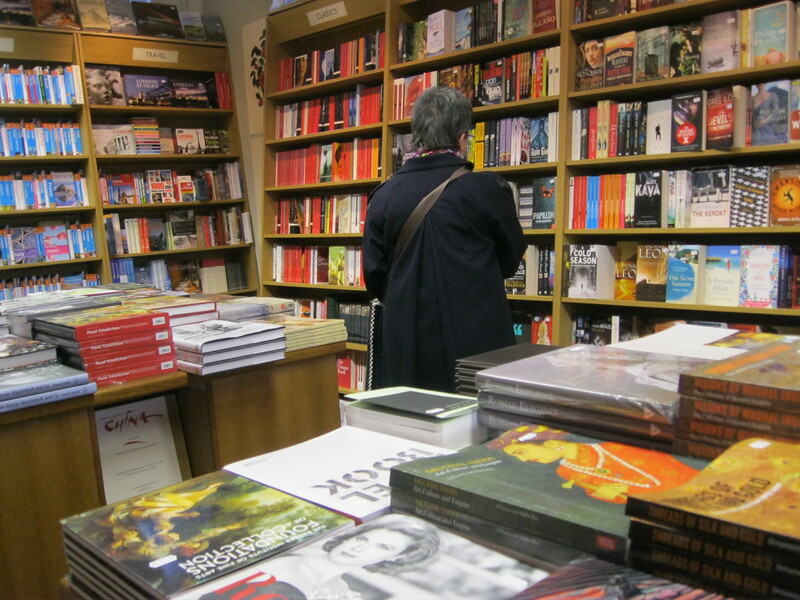 Bookshops are the best and they’re the first place I visit on my travels – to see the books and the mix of people in them. Thanks for a great and heart felt post! It’s not just reader apathy and e-tailers killing books and the bookshops that sell them when new. When we buy a second-hand book, the writer and the publisher receive nothing, zip, zilch. Some writers might choose to do without publishers, but readers can’t do without writers, and writers need to eat. When we borrow books from public libraries in countries with a lending rights scheme, the writer gets some compensation for lost sales. When we buy (rather than illegally downloading pirated files) e-books, the writer and publisher receive payment. 3) I can’t believe I’m saying this: buy e-books in preference to buying second-hand books. 4) buy second-hand as a last resort. Second-hand bookshops are great for readers and good for the environment but they give nothing back to writers and publishers, and I think leaving the writer and publisher out of the equation is a sure way to kill books in any format. Bookshops offering unused books can’t please bargain-hunting readers who compare the price of a newly-printed book to a second-hand one. In some ways, I think the second-hand bookshop does as much harm as the e-tailer (if your aim is to keep books and new-book bookshops alive). I wish the e-book had never been invented but I’m grudgingly coming around to the view that it won’t go away. The e-book is inferior to the real thing but it’s here to stay, no matter how much I rant about its inferiority or what it’s doing to writers. I think bookshops might have to offer both printed books and e-books to stay alive because readers want cheap books delivered quickly, which is why e-tailers and second-hand books are so popular. (d) I use and share around my books with family and friends where appropriate because that’s not being a dog in the manger and because acquaintance with a previously unfamiliar author or genre can lead to the purchase of similar books by those enthused by my recommendation. Hey, thanks to both of you for commenting with food for thought! I too am a bookshop omnivore – I support all types from the local independents to secondhand shops, to book markets and stalls, to academic bookstores and of course the high street chains like Waterstones. There have been secondhand books as long as there have been books and I don’t think that in itself is a threat, but I agree with you that it’s important to support lots of different kind of media and to make sure that the money for the books gets to the authors (especially the indie or lesser-known ones) as often as possible. I think there is still value in secondhand buying though, since it fosters the kind of flexibility and the sense of adventure that leads readers to move outside their comfort zone (much as I hate that phrase!) and seek out books that aren’t bestsellers. I would hope that those readers will eventually become supporters of the written word in all its forms. Ebooks will never ever win me over, but that said, I do recognise that they may stick around, so if we can use them for good (supporting newcomers) instead of evil (reading 50 Shades of Grey on the tube) then I might be willing to tolerate their use as one of many mediums. Though I’d rather not. Anyway, it’s an interesting conversation and I frankly I don’t think any of us know how these things are going to play out, I just hope it works out for the best for bookshops, writers, publishers and readers. Okay, and I secretly hope Amazon get their comeuppance at some point. Thanks so much for commenting and for your interesting opinions! This is the second post I’ve read here and enjoyed this one too. I have to confess I buy a LOT from Amazon, though I still tend to get real copies of books that I get on Kindle, which isn’t that many. I may have to change my book buying habits because I do love the bookshop experience. 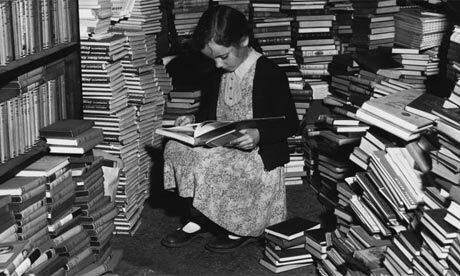 Not only will bookshops be out of business…so will my employment as a bookseller. I treasure all the moments of time when I’m working with customers seeking real books to share with their children, the booktalk we engage in, and the excitement over the possibilities. I agree wholeheartedly with what you have to say and I will never succumb to the idea that bookstores and the love of holding a ‘real’ book in hand are fading away. Another superb posting from the Matilda Project. With grateful thanks. Love the Folio Society editions, but I’ve never seen them sold in a bookshop in the US. Very jealous that you have them so accessible! Must add a very beautiful shelf to any bookshop. We are becoming a world community where so much is now glossed over, and I was already out of place. This just make me feel doubly so. Still, this is a beautiful post and I stand with you and all who stand for such things as long as possible. All the new updates to our world is making us so disconnected from one another and traditions that may have some merit. Thanks for checking it out! I’ll come visit if I’m ever in Suffolk, but until then Happy Reading and Happy Bookselling! Supporting local bookstores has to be a conscious worldwide effort. It would be a sad day if they became extinct. Right now they are certainly an endangered species. I love bookshops! On a three day trip to London I really can’t choose which to visit!!! Hello Emily, thank you for such kind words about our bookshop!This is a fantastic blog. Would you mind if we shared your blog on our website/ facebook? Great to hear from you and I’m very glad you enjoyed the blog! I love the bookshop and loved writing this post; I only feel a bit guilty that it may have been overshadowed a bit by my ranting, but hopefully something positive about South Kensington Books still came through. Please feel free to share the post, the more the merrier!